Katherine “Kae” Bohach (nee Esopenko) passed away suddenly and unexpectedly on the evening of April 3, 2019 in Kelowna, British Columbia. Kae was a fantastic and loving mother and “Baba” to her children and many grandchildren. She was loved and revered by everyone in the family. A fantastic cook, her Ukrainian food and baking was legendary. Any traveller arriving at her home was always treated to the most delicious soup one could imagine and a warm welcoming hug. When one left, they were always treated to a delicious and abundant lunch. Food was synonymous with how she loved and nurtured her family. As the matriarch of our family, her character exuded a quiet but effective power. She worked tirelessly all her life right to the last. She was born at home on December 17, 1931 in the remote Ukrainian immigrant farming community of Strong Pine, Saskatchewan. As typical of Ukrainian immigration of that era, her father Michael Esopenko arrived in Canada first to organize a farm and home. Her mother Maria arrived two years later with children, Leon and Anne. Kae was the product of her parent’s reunion. Life on the farm was difficult, but the community was strong and the Esopenko family was blessed with an abundance of love. Kae’s mother Maria passed away after a long illness and when Kae was just 13 years old she had to quit school to become the “mother” of her “first” family which comprised of her 6 younger brothers and sisters Sandy, Mary (Mimi), Nick, Janey, Stephie and baby George, plus supporting her father and 3 older siblings. To be thrust the responsibility of nurturing 10 family members on a 13 year old situated on a remote farm is beyond comprehension. But our mother was more than up to the task. She gave of herself to provide the nurturing love that allowed all those children to grow up and have successful lives. Our mother was a giver. 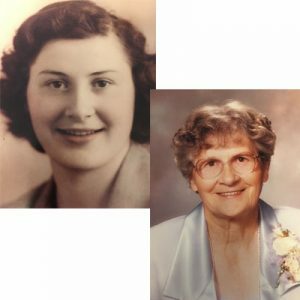 When she was 20 she met a young man, Bud Bohach, on a train trip from Saskatoon to Prince Albert. After a courtship, they married on November 15, 1952 and settled on a farm in the mainly Ukrainian community of Honeymoon, Saskatchewan. Their union produced 5 children…Adrian, Celeste, Loring, Carmen Christine and Tyler. In addition to looking after her children, Kae worked tirelessly milking the cows, doing “chores”, tending a huge garden, canning legions of fruit, wild berries, jams, meat and so on. By October of every year, the basement was full of jars of food to support the family through the cold winters on northern Saskatchewan. Kae and Bud moved to Prince Albert in 1965 to provide better educational opportunities for their children. Kae worked nights at the Victoria Union Hospital and Mount Saint Joseph care home to support her family. Working nights allowed her to also work alongside her husband Bud on the farm. As mentioned, she was a tireless worker. In 1988, the farm was sold and Kae and Bud moved briefly to Red Deer before retiring in Vernon, BC. In 2000 they moved to a beautiful home in the Rutland area of Kelowna where they enjoyed their home, their wonderful neighbours and hosting countless visiting friends and family members. Mom’s soup was the legendary welcome for any visitor, no matter at what time of the day or night they arrived. Kae was a staunch member of the Ukrainian Greek Orthodox church. No matter where she resided, she supported the Women’s Auxiliary bake sales and other church functions. Over her lifetime, she make tens of thousands of perogies, hundreds of pies, baking and other food to support the church as well as numerous community events. When people were having a good time on the dance floor, Mom would be found in the kitchen making the sandwiches and washing the mountains of dishes…by herself. Our mother’s tireless work ethic and boundless love is weaved into the thread of every family member. We all owe her gratitude for this heritage. She leaves behind the love of her surviving siblings, her 5 children, 16 grandchildren and 6 great grandchildren. Family was everything to her. She gave her love fully to all her family, and the people in their lives, without pretense or reservation. No one in the family could not notice how hard she worked…from the time she was a young 13 year old teenager, to the day she passed away at age 87. She was the glue that held the church, the community and our family together. She will be missed terribly by everyone, especially Bud her husband of 66 years, who passed away 8 days later. A Prayers Service will be held Monday April 22, 2019 at 7:00pm at Springfield Funeral Home, 2020 Springfield Road. Funeral services for both Kae and Bud will be held at Springfield Funeral Home, 2020 Springfield Road, Kelowna, at 10:00 a.m. on Tuesday, April 23, 2019. Lunch will be provided after the services. In lieu of flowers, the family suggests making a donation in both our parents’ memories to the Kelowna Hospice or any hospice of their choice. The prayer service for BOHACH, Katherine “Kae” is scheduled for Monday April 22, 2019 at 7:00pm at located at 2020 Springfield Road, . The service for BOHACH, Katherine “Kae” is scheduled for Tuesday, April 23, 2019 at 10:00 a.m.. Below you will find the map for the service location and the contact information should you have any questions. My deepest condolences to you all. She was a great lady and always welcomed me into her home. For the family of Kae and Bud, and all of their wonderful friends. Our deepest sympathies can only remind us that Bud and Kae will last forever in the memories of those who knew them, and through fond recollections be passed on for generations to come. Our visit to Kelowna with Loring and our daughter Daphne were filled with warmth and kindness, and of course our bellies were filled with Kae’s famous perogies.